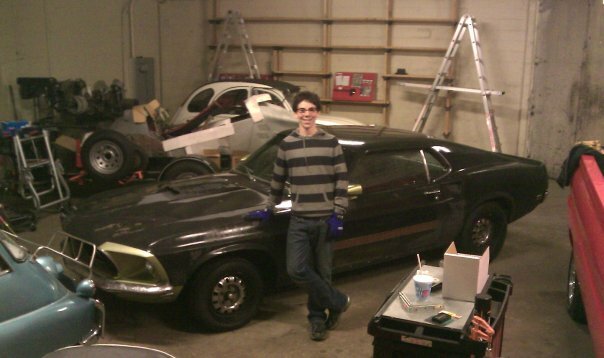 Rather than buying me a car when I turn 16, my dad thought it would be a great idea to buy a car we could work on together for a couple of years, so I would end up with a car I could call my own when I get my license (and give me a crash course in car restoration). We had considered “restomodding” an old muscle car for quite some time, but I never thought we’d finally get around to it (Mom didn’t like the idea of a car without airbags). Anyhow, Dad had me finding and reviewing hundreds of classified ads to get a good understanding of values for early Mustangs (the different models and years in various conditions). The reason we picked the Ford Mustang was because of the large number of cars manufactured and the huge selection and wide availability of aftermarket parts. Our requirements were: (1) a ’65 to ’70 model, (2) a fastback body (because we both like the sports-car look), (3) a complete car (one that has all the necessary pieces on and in it), (4) no rust/body filler and a straight frame, and (5) a car without mechanical problems. We developed a list of questions to ask the sellers and my dad helped guide me through the process of buying a car. After making calls on many cars, last December I finally found a viable candidate in Sacramento. The car is a 1969 GT “S Code” fastback, which means that it was built with a 390ci V8 engine (it had been switched out for a 302 V8 somewhere along its history). According to scodemustang.com, “the GT option is extremely rare in 1969 as it was phased out in favor of Mach 1 and Grande styling” – so the car I found was potentially very rare. After a few phone calls for information, we scheduled a trip to Sacramento to check out the car. With the U-Haul trailer hooked up, Dad quizzed me on our very extensive inspection checklist on the 3 hour drive there. Once we arrived, we spent another three hours inspecting, testing and probing every surface and component of the car. We were satisfied that we had found a great project candidate, so we closed the deal and hauled the car back to our garage. The purpose of our project is to create an everyday driver for me when I get my license, so safety features and reliability will be top priorities after basic restoration. To have a little fun with the cosmetics, we’ve decided to make a Boss 302 replica. After that, we’ll look at the budget and consider other potential options or modifications. 44 mySQL queries in 0.162 seconds.